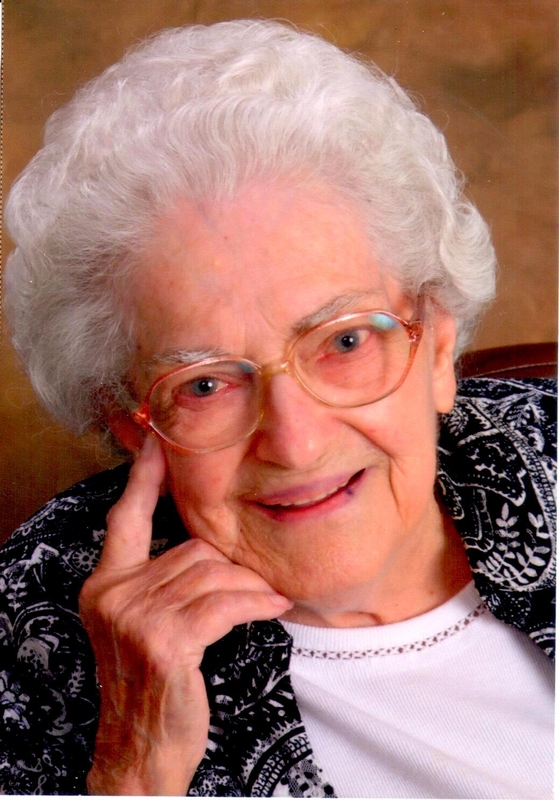 June Eileene (Comer) Hartley, age 96, died on March 26, 2019 at Kansas City Hospice House after a brief illness. June was born April 19, 1922 in Calhoun, MO to Joseph Agee Comer and Edith (Wright) Comer. She was reared and attended schools in Windsor, MO and graduated from Windsor High School. While in her teens, she held offices in the Order of Rainbow for girls and was a member of the Order of the Eastern Star for 75 years. She met her future husband, Hollis Nathan Hartley, on a blind date and they were married May 10, 1941. The couple moved to Lees Summit in 1945, became members of the Lee’s Summit United Methodist Church, and welcomed their first daughter in 1946. For several years, June was employed in Kansas City while her husband finished Law school on the GI Bill. From 1952 to 1957 they completed their family, adding 2 girls and the final boy to their brood, after which June went to work at Western Electric, where she stuck it out for 25 years. In 1974, June studied for and passed the test for her Real Estate License. She loved looking at houses, but admitted later, she did not have the “get up and go” it took to sell them. After retiring, June purchased a small motor home with the intention of visiting all the National Parks. After a couple of short jaunts, she was hooked. She sold her home, got a larger R.V. and never looked back. She spent the next 23 years covering all the states (except Hawaii) and most of Canada. She went to the tip of Florida, the top of Alaska and the farthest eastern shores of Nova Scotia. The most enjoyable part of her travels was belonging to the R.V. club for singles, Loners on Wheels for which she was (jokingly) referred to as their official photographer. June gave up traveling in her 80’s and settled back in Lee’s Summit where she could enjoy her family. She found the Red Hatters and loved her adventures with them. She also enrolled at Longview College. Her criteria was that the OATS bus could take her, the classes had to be on Tuesday and Thursday and the classroom was preferably the closest to the bus stop. Class subject was not a top priority. Just this last Christmas she flew to California to visit with family and met her first great-great grandchild. Since then she had two brief illnesses before passing quietly and peacefully. June was preceded in death by her father, mother, brother, husband and infant son, Hollis Forest Hartley. She is survived by daughters Phyllis Ann Chrisman and spouse Dori Shimer of Sunnyvale, CA; Nancy J. Rooks of Kansas City, MO; Gayle Alley and husband Phil of Pleasant Hill, MO; and son Russell Hartley and wife Kim of Olathe, KS. Also surviving are 10 grandchildren, 14 great grandchildren and 1 great-great grandchild. The family would like to express its thanks for the care given by the staff at St. Joseph’s Hospital and the warm loving reception provided by the Kansas City Hospice House. Memorials are suggested to: Leukemia & Lymphoma Society or Meals on Wheels. So sorry for your loss. Treasure the memories! Dear Nancy, A piece of your heart and soul have moved on. Her love, her great adventures, your memories and a great family are her tribute to a life well lived. Hugs around you and your beautiful family. Your final tribute to your mother was wonderful. May you all find peace and joy when you think of the adventures and full life this person you called “Mom” enjoyed. I enjoyed talking to June during my rides to school every day. We will miss her so much. My prayers are with you all at this time. I know the heartache and the loss you feel. May God keep his arms around you in the days ahead to comfort you. Nancy keep your family close and enjoy every day you have together. It was fun to getting to know Ms June. Your stories were fun to listen to. The hallway at Longview Community College have gone silent. You are dearly missed. I delivered Meals on Wheels to June every Monday. I cherish our conversations. We always left each other by saying, “I love you.”…. I will miss her so much and extend my deepest sympathy. I’m so sorry for the loss of your Mother. Sounds like you have lots of great memories to cherish.